Seared tuna sashimi is a common dish served in sushi restaurants, and you may also find it at other types of restaurants. This seafood recipe calls for slices of tuna sashimi -- high quality raw tuna -- to be briefly seared along the outside edges. Seared tuna sashimi is a healthful and low calorie option for your meal plan that contributes healthy macronutrients. A 4.5-oz. 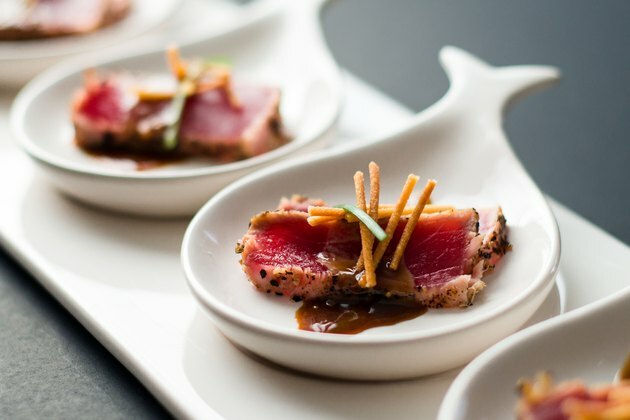 serving of seared tuna sashimi contains 202.2 calories. If you adhere to a 2,000 calorie diet, the number of calories in this fish dish account for 10.1 percent of your daily allowance. The calories in seared tuna derive from its macronutrients -- protein, carbohydrates and fat; a calorie itself is the measure of energy a food provides for your body. The number of calories you need each day varies, depending on your gender, nutritional goals and level of activity. Seared tuna sashimi is a good source of protein, with 25.9 g per 4.5-oz. portion. The protein in seared tuna introduces quantities of all essential amino acids into your meal plan; these nutrients assist in breaking down the foods you consume. In addition, the protein in this dish provides energy, and it also boosts the effectiveness of your immune system and your body's ability to repair tissues and cells. Consume 50 g to 175 g of protein daily to reap these benefits. Including 4.5 oz. of seared tuna sashimi in your diet does not provide a significant portion of the 225 g to 325 g of carbs you require each day for energy -- 8.1 g. Consider serving this dish with a side of steamed white or brown rice to increase your carbohydrate intake. A serving of steamed vegetables or vegetable sushi also boosts your carb intake. A study published in the May 2011 issue of "Public Health Nutrition" indicates that Chinese children routinely suffer from stunted height and excess weight due to lack of nutritional diversity stemming from not getting enough carbohydrates and too much protein in their diets, so aim for a balanced diet when including seared tuna sashimi in your meal plan, especially for growing children. One serving of seared tuna sashimi contains 7.3 g of fat. While tuna is considered a fatty fish, the majority of the fat is good-for-you varieties such as monounsaturated and polyunsaturated fats. Despite this, excess fat in your diet may trigger weight gain, so keep your intake to 20 percent to 35 percent of the calories in your daily diet. Seared tuna sashimi is also a good source of fatty acids, such as omega-3. These types of fatty acids provide benefits for your heart. All fish contains some mercury, a compound that may trigger nervous system problems, so you may need to reduce your intake of seared tuna sashimi. Albacore tuna is higher in mercury than other types of tuna; decrease your consumption of seared albacore tuna to 6 oz. per week, particularly if you are pregnant.